I have a motto which I’d like to think I stay true to, ‘don’t get too gassed off of your own clout, otherwise you’ll get clapped in the mouth’. Wow, that would make a good rap lyric to be fair. Anyway, the point I’m trying to make here is just because you’re living your so-called ‘best life’ don’t let it get to your head. Because sooner or later karma will come for those receipts. Just ask this unlucky guy whose attempt at showing off came back to bite him in the arse… immediately. There’s an argument which can be made that a car is the most prized possessions most hot-blooded, young men can have. And like all possessions you’ve got to look after your toys. So this individual got exactly what he deserved when he decided that owning a luxury sports car wasn’t satisfactory enough and standing on the hood would give him the validation he so desperately needed. Turns out it’s not a good idea to stand on a Lambo, not only is it an act of war to desecrate such beautiful workmanship, but they can’t withstand someone’s bodyweight either. 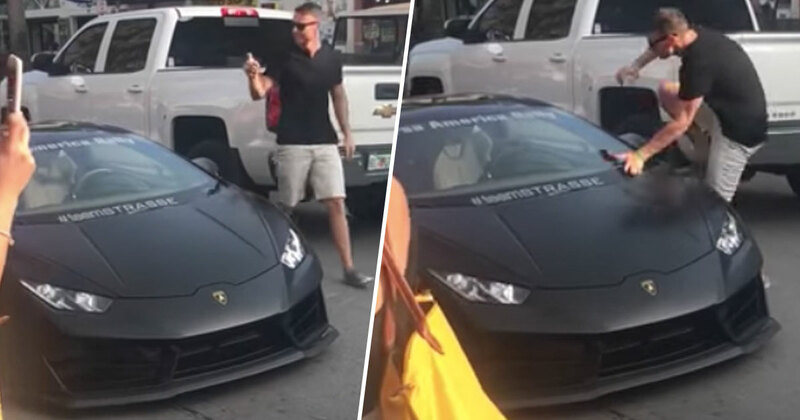 This unnamed Lamborghini owner found out the hard way during an Autopride day in Key West, Florida, on July 19. 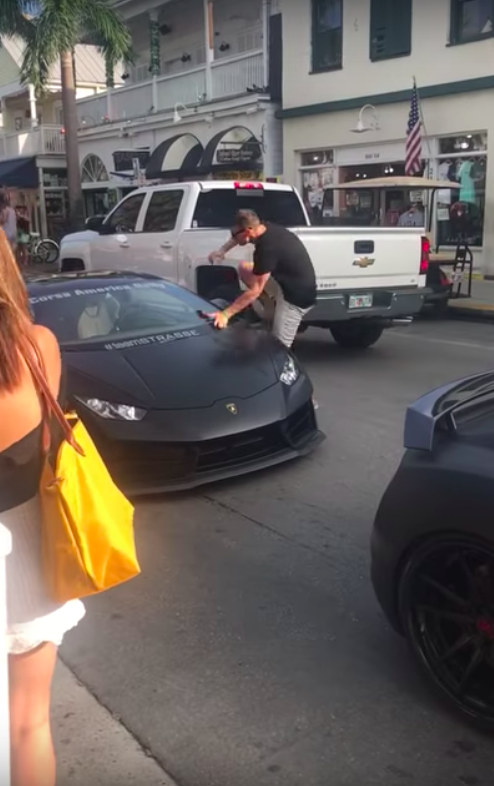 While in a procession full of beautiful sports cars, the owner of the black Lambo decides to exit his car and stand on top of it, in the process he cracks the windscreen – much to the chagrin of his female companion in the passenger seat. The moment they both realise what’s happen his lady friend buries her head in her hands while the driver goes back into his car, presumably red faced. Sometimes you’ve got to learn the hard way to eat some humble pie. Windscreen replacements aren’t cheap you know. It’s as if 2018 has become the year for standing on top of cars and acting unruly. During the World Cup, fans took liberties with parked cars, buses and emergency service vehicles as a way of displaying their over-the-top excitement for their country’s victory. During the street celebrations after England beat Sweden 2-1 in the quarter-finals on July 7, some people took it a bit too far. Whether it was the influence of alcohol or just mob mentality – or maybe a combination of the two – but some fans celebrated rather too much, causing mayhem and damage to vehicles across the country. In central London, an ambulance car was badly damaged after revellers decided it would be a good idea to get on top and jump up and down on it. In the fallout, the ambulance had to be taken off the road to be repaired after members of the rowdy crowd took it in turns to climb on top of the vehicle. The emergency vehicle was parked near London’s Borough Market as a London Ambulance Officer attended a call nearby, according to The Mirror. The Joint Response Unit responsible for the ambulance, shared their response on Twitter. Obviously we are chuffed with the result this afternoon but there is absolutely NO excuse to vandalise emergency service vehicles by jumping on them. This vehicle is now off the road and unable to respond to patients. We are better than this England. Obviously we are chuffed with the result this afternoon but there is absolutely NO excuse to vandalise emergency service vehicles by jumping on them..
Why is it there has to be a minority who have to ruin it for the rest of us all the time?